Itsuki is in the second year, the student council president and the grandchild of the current principal of Myōdō Academy. Itsuki appears to be a gentle, handsome, and athletic boy with a princely demeanor who attracts many subordinates and fans. At the beginning, Tsubomi developed a temporary admiration for Itsuki until discovering her female gender. She cross-dresses due to her having to substitute as the heir of the school and dojo in place of her ailing older brother, Satsuki. However, she maintains a great love for cute, girl things and is convinced to join the fashion club. In the events of Episode 22, she picked up Potpourri and thinks it's cute. She later becomes Cure Sunshine to rescue Tsubomi and Erika from danger with Potpourri while saving her brother's Heart Flower. 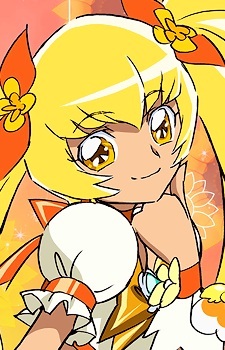 As Cure Sunshine, her theme color is Gold and her flower symbol is the Sunflower. Her powers are related to the sun and can use auxiliary attacks in addition to her finishing attack. Her catchphrase is "I will heal the darkness in your heart with my light." She introduces herself as "The flower bathing in the sunlight, Cure Sunshine!" Sunflower Aegis - The sunflower-shaped shield generated by Cure Sunshine. Soon after an attack of an enemy hit right onto the shield, the attack goes towards where it was set. Sunflower Protection - Cure Sunshine's secondary shield attack, which protects her from incoming attacks. Unlike the Sunflower Aegis, the attack doesn't recoil back to the enemy. Gold Forte Burst - The finishing attack that Cure Sunshine uses, used to purify a Desertrian. Unlike the Pink and Blue Forte Waves, this attack uses the Shiny Tambourine. Cure Sunshine summons her Shiny Tambourine and thumb rolls the sides of the tambourine. All three sunflower symbols light up before it's gemstone center starts to shine. The tambourine surges with purity energy, and Cure Sunshine taps it four times before declaring the attack name. She then shoots out several yellow, orange, and red energy flowers at the Desertrian. An implosion occurs, and the target is suspended in the air, a sunflower having overlapped behind it. Cure Sunshine moves the tambourine in a circular motion, and in a flash of light, the enemy is purified. Cure Sunshine says these lines after summoning her Shiny Tambourine: Gather, Power of Flowers! Shiny Tambourine! Dance and spin, Flowers! Precure Gold Forte Burst!